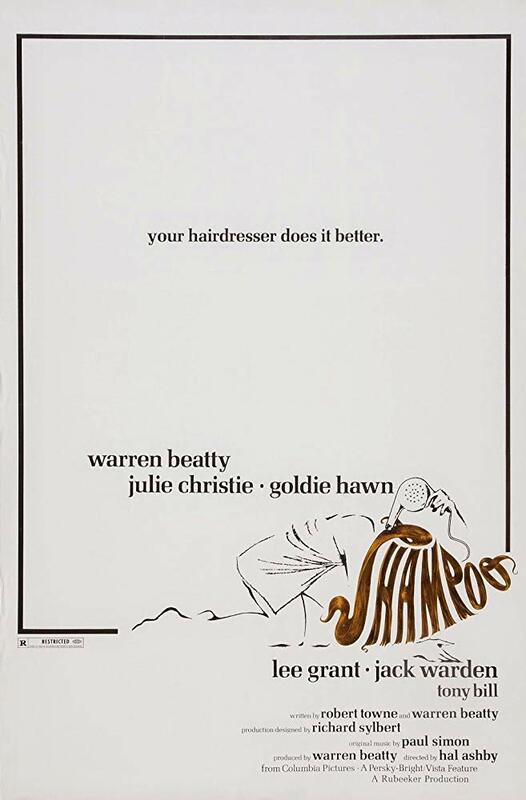 A hairdresser (Warren Beatty) lies to and cheats on his steady girlfriend (Goldie Hawn) while bedding the wife (Lee Grant), daughter (Carrie Fisher), and mistress (Julie Christie) of the man (Jack Warden) he’s hoping to secure funding from to open his own salon. Warren Beatty and Robert Towne co-wrote this satire (directed by Hal Ashby) about the vacuous lives of various Hollywood denizens, both rich and aspiring-rich, who mostly want sexual satisfaction and financial freedom but occasionally (like Hawn) show leanings towards something a little more wholesome — say, kids. It’s a depressing yet amusing farce, set during Nixon’s triumphant election over Humphrey in 1968, presumably to show that self-absorbed individuals may merit leadership by equally self-absorbed politicians. However, the primary focus is on George (Beatty) as he zips around L.A. (helmetless) on his Triumph motorcycle, doing women’s hair while hopping from one bed to the next. Beatty plays on his own public image as a sexual Lothario, ultimately coming across as hedonistically distracted at the cost of any other considerations (including loyalty, honesty, or the chance to open his own business). The most charitable character by far is Hawn, who thankfully has other options available to her.